Sunrise in the bush. Early morning cool before the sun climbs higher and bleaches everything. This is my favourite time of day. Full of potential. Don’t you just want to walk out into that forest? The title is a reference to a set of paintings by Umberto Boccioni called States of Mind. Like most of the Futurists he was a mad fascist obsessed with everything modern, and I don’t particularly like the paintings but, as I’ve emigrated across the world, I’m interested in how we deal with going and being left behind. Melancholy? Yeah baby, melancholy. There is a companion to this: Dusk (Those Who Stay). Lars, I’m always touched by your synopsis, your story of the paintings. 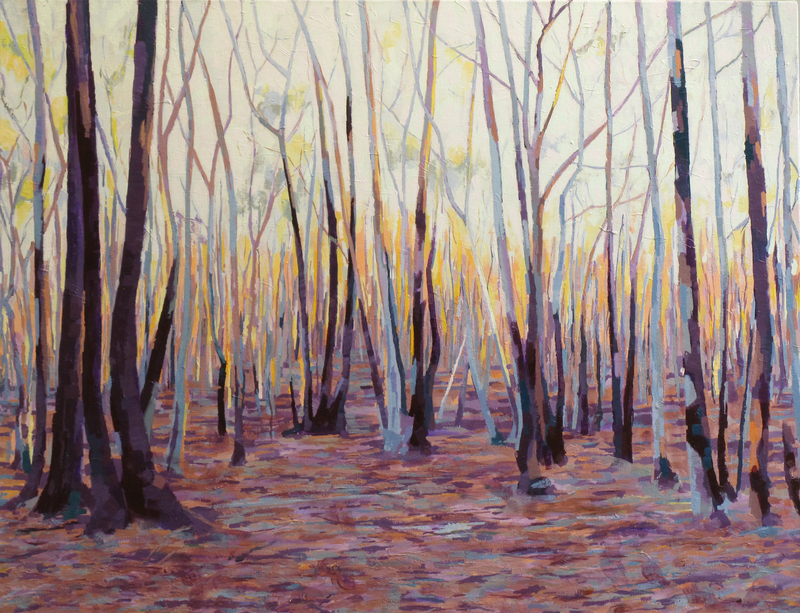 In this piece, I feel both the mystical quality of dawn –and the loneliness of the leafless trees. Thanks Laurel. I like to share the experience of the bush here in Australia, so it’s good to know you can feel what I felt.